The New York Islanders announced today that forward Jeremy Colliton has been signed to a one year, two-way (NHL/AHL) contract. 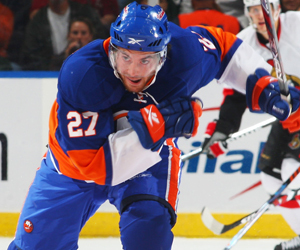 The Islanders drafted Colliton in the second round, 58th overall, of the 2003 NHL Entry Draft. Colliton played in 19 games with the Islanders during his rookie season in 2005-06, and has totaled 42 career NHL games with the Islanders in his six year professional career, posting one goal with two assists and sixteen penalty minutes. In 250 career games with the Sound Tigers, Colliton has scored 134 points (50 goals, 84 assists). The 6-2, 209-pound center played for Rogle Angelholm of the Swedish Elite League last season, notching 21 points on eleven goals and 10 assists in 46 games.